Mia Ramsay was spotted leaving her address on Old Dalkeith Road, Edinburgh, on Saturday. A search has been launched to find a missing 15-year-old girl after she failed to return home two days ago. 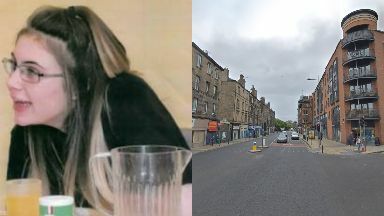 Mia Ramsay was spotted leaving her address on Old Dalkeith Road, Edinburgh, at 10.20pm on Saturday. She was last seen on Great Junction Street at 7.25pm the following evening but has yet to return home. Police are now appealing for information to help trace the teenager. Mia is white, 5ft 7in with long dark hair and blonde tips, a hooped nose piercing and was last seen wearing a pink onesie with a white tail. She has asthma and it is unknown whether she has her inhalers with her. Officers said concern is growing for Mia's welfare and anyone who knows her current whereabouts is asked to come forward. A spokesperson added: "We would also ask Mia get in touch or return home so we can confirm she is safe."